At auctions, you can expect auctioneers talking a mile a minute and buyers waving their paddles in the air. So how are people able to keep up enough to actually make a bid? 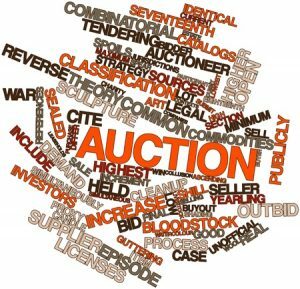 Knowing common auctioneer terms can be the key to success. Known as “the chant,” auctioneers’ fast-talking styles date back to the 1920s. The chant consists of three parts: the statement (“I’m bid ten dollars”), the suggestion (“Ten dollars, twenty dollars”), and the question (“Do I hear 30?”). Filler words are any words used between bids to keep the rhythm of the chant going. Each auctioneer uses words differently to create their own unique style. The use of filler words also gives buyers a brief moment to think about their bids. If you watch shows like Antiques Roadshow, you may be familiar with the term “provenance.” Provenance refers to the item’s ownership history, tracing back to its creation. A long and well documented provenance can increase the value of an object up for auction. The hammer price is the final, winning bid. The word “hammer” is a reference to the bang of the auctioneer’s gravel or hammer that seals this final bid. When you’re planning your next auction, contact us at Smith & Co. Auction & Realty, Inc. and let us help you make it a success! We’ve been in business for over 20 years selling everything from farm machinery to 3100-acre ranches, and we are Northwest Oklahoma’s choice for all of your land auctions and real estate needs.